The Chinese believes in striking a balance between yin and yang. In the chills of winter, you need to take care of the yang aspect of your body. Ye Jun shares some pointers. As the coldest winter in the last 28 years pushes the mercury to dip to a low of -15 C in Beijing, traditional Chinese medicine doctors share some tips to keep warm and fit to cope with the chilly days. "Winter is a time to take good care of the yang aspect of the body," says Wang Yuntao, a traditional Chinese medicine doctor with Beijing Dongwen Clinic. According to TCM theory, the balance of yin (cool, calming side of the body) and yang (hot, stimulating side of the body) energy in the body plays a vital role to ensure good health. Once the balance is impaired by factors such as emotions, improper diet and overwork, the body will fall sick. The function of yang can be compared to a cup of hot water: Inside a warm environment, it stays warm longer; but inside a cold environment, it turns cold faster. The yang factor is the ability to keep warm, Wang explains. "The most important rule of keeping fit in winter is not to exert yourself, either physically or mentally," the doctor says. Wang says to understand the rules of nature better, observe a tree's growth cycle. In spring it grows with dew; in summer when yang energy is abundant, it grows fast. In winter, like the tree, yang energy penetrates the human body to warm it up, leaving the surface feeling cold. "Winter is therefore a time to conserve yang energy and not to waste it," he says. "Otherwise in spring, the body will lack the strength to grow." 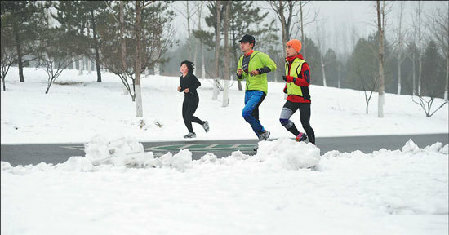 Wang says Chinese have a tradition of adapting to seasonal changes and following certain rules to stay fit. "But foreigners don't. That's the cultural difference," he says. Wang believes that Caucasians have a different physical build compared to Chinese, and a different diet that also contributes to different physical reactions to seasonal changes. He says Chinese people are more sensitive to weather changes. "It might seem strange for foreigners to see us Chinese drinking hot water all the time. It is equally surprising for Chinese to see some Caucasians in just shorts and T-shirt during winter," he says. Wang stayed in the United States for half a year, investigating the state of Chinese medicine there, and teaching tai chi. He studied the differences between Chinese and American diets and living habits. "I noticed that Americans eat more deep-fried and roasted foods. I think that might bring extra heat to the stomach and make them want to drink ice water," he says.